When thoughts of a cemetery come to mind, the concept of plots and tombstones was just the beginning for a group of men gathered in San Francisco in 1905. J.B. Treadwell, Albert Burgren, Tom Ross and his father, known as Pop Ross, would be the group of men that began the Forest Lawn Cemetery, now Forest Lawn Memorial-Park in Glendale, California. While these four men originated the not-for-profit cemetery in 1906, it was when Dr. Hubert Eaton took over the management of the cemetery that the “memorial-park plan” came to life. In John F. Llewellyn’s Birth of a Cemetery, the very beginnings of the cemetery are chronicled. 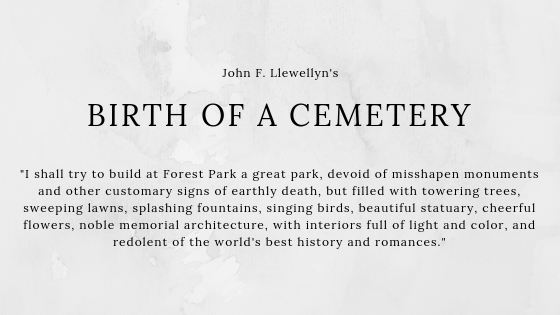 From forming the Forest Lawn Cemetery Association to the construction of the mausoleum, Llewellyn’s detailed and extensive research is apparent on each page. He dissects the financials that come with owning a cemetery and the challenges they faced to create a profit. He gives background to each principal character and how they contributed to Forest Lawn. He provides figures throughout each chapter that add visual components to the facts. He presents appendixes, a bibliography, notes and an index of every piece of information shared. It’s easy to see the hard work that went into crafting each chapter. That being said, this is a book for a specific type of person. This is not a book about the memorial-park’s famous residents – L. Frank Baum, Walt Disney and Elizabeth Taylor are some of the celebrities buried in the original Glendale location while others such as Carrie Fisher, Liberace and Garry Marshall reside in the Hollywood Hills location – but about the planning, building and managing of a cemetery. There are dozens of names and organizations to memorize, countless financial situations that involve numbers and figures and business management characteristics that describe stock deals and merging businesses. The story behind Forest Lawn Memorial-Park is rich in history and art that isn’t really touched upon throughout this book. In addition to its famous residents, the Glendale location houses a museum of permanent and rotating art exhibits. There are 1,500 statues including replicas of Leonardo da Vinci and Michelangelo. Three non-denominational churches have held marriages including Ronald Reagan’s. The “memorial-park” concept is beautifully fascinating, and it has made a clear impression on those that requested their final resting place be inside its gates. Its painstakingly precise research needs to be applauded for Llewellyn, but the story of a group of men who were ineffective salesmen with strained relationships, contract disputes and illegal loans is not of interest to those who want to read about the cemetery’s legacy. Birth of a Cemetery is a unique view on the evolution of Forest Lawn, but a view that peaks the interest of a select reader.